You know we love gourmet food trucks, right? So what could be better than an afternoon’s worth of food trucks and an opportunity to get a meal for free? Saturday, April 21 from 12-4 p.m.
Get a buzz buck for a free menu item and beverage while supplies last by registering at www.therow360.com. Make sure to arrive at the event early to get your truck choice– there are limited buzz bucks per truck. Even if you are unable to register before the buzz bucks are all claimed, the event is open to all (bring some cash as many of the trucks don’t take cards). Now here’s the fun part: South Bay Sparkle is giving away two free “buzz bucks” worth a meal and a drink, and you don’t have to register. Just leave a comment below and we’ll pick two winners on Monday, April 16. To get an extra entry, “like” South Bay Sparkle on Facebook or follow South Bay Sparkle on Twitter (and leave an extra comment letting us know you’ve done so). Yum! What’s more fun than going to a restaurant? 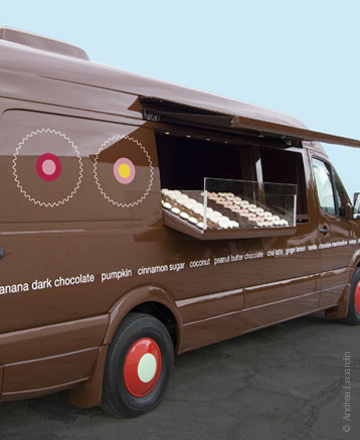 How about going to a whole bunch of restaurants at one time – especially if those restaurants are on wheels? That’s one way to describe a food truck event, a relatively new phenomenon born and perfected in L.A.
We were lucky enough to get to sample a bunch of the region’s best food trucks at the South Bay Food Fest last weekend at the Home Depot Center, thanks to Michael at South Bay Foodies. With more than 30 food trucks gathered in the breezeway outside the main stadium, people came in droves and waited in some cases for upwards of one-half hour to reach some of their favorite trucks. In fact, we never even saw the side of the CoolHaus truck because the line to get those famous ice cream sandwiches stretched nearly the length of the festival (although South Bay Rants n Raves swears it exists!). Here are some pictures so you can visually “sample” each truck – along with some links to follow so you can sample them yourself. SlapFish: The SlapFish folks cook up sustainable seafood while delivering their special brand of cheeky fish humor in every dish. There’s the “lobsticle” – a lobster tail on a stick – and there’s also the “Because We Have To” fish taco. 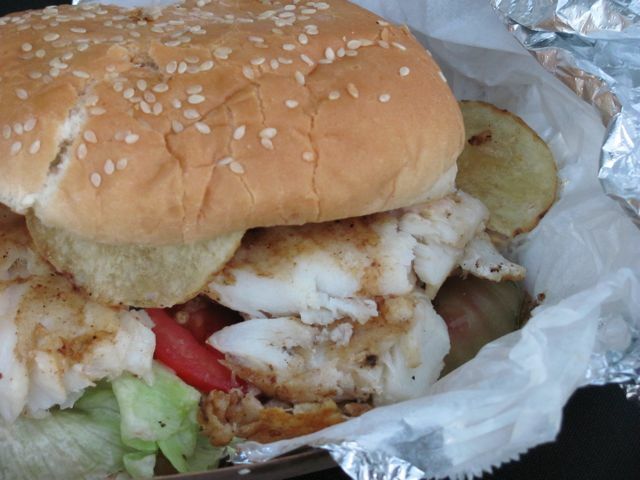 But the favorite in our family is Major Crunchy, a towering sandwich of sea bream, lettuce, tomatoes, pickles, jalapeno sauce, and…potato chips. You heard that right. You can find their schedule right on their home page. 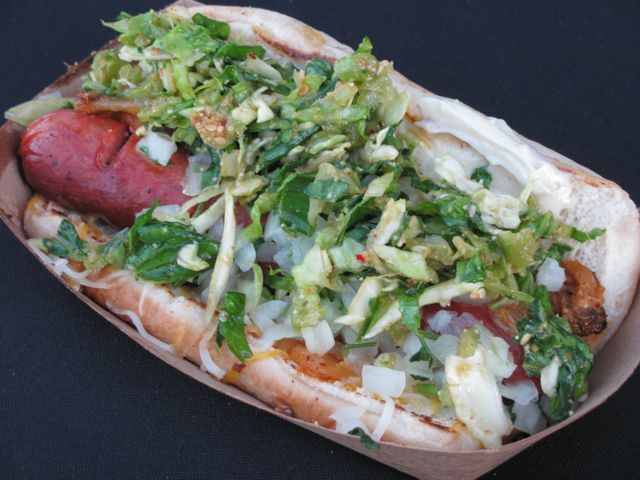 Kogi BBQ: The food truck that started it all…Kogi serves up Korean/Mexican “high-end food at street-level prices.” Of course the Kogi tacos are the classic foods to order, but we’re especially partial to the kimchi quesadillas and the kogi dogs (pictured here). 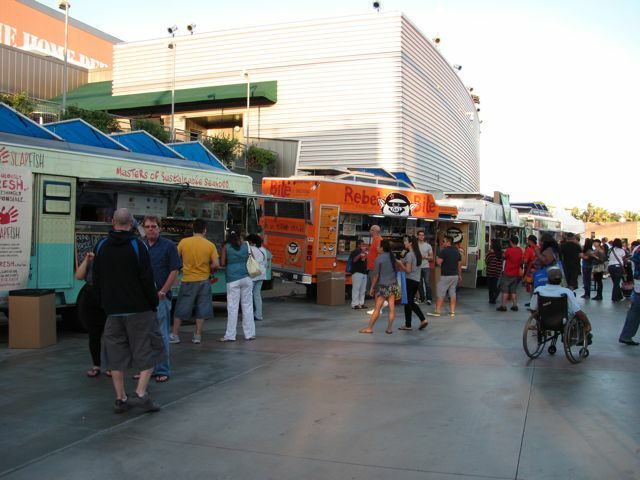 Kogi has five trucks that travel L.A. and Orange County; check out the Kogi home page for full schedule information. Nom Nom: It’s hard to lose track of the bright kelly-green Nom Nom Truck, another L.A. phenomenon. 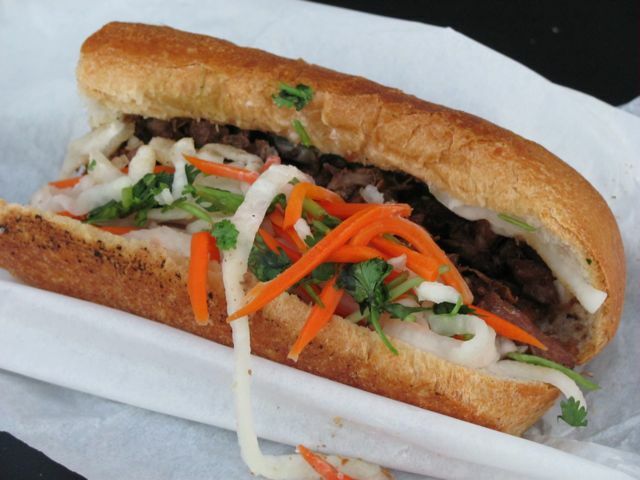 Nom Nom delivers tasty Vietnamese fusion foods like Vietnamese tacos and their ever-popular Banh Mi sandwiches (grilled pork with honey glaze, marinated carrots and daikon radish, cucumbers, jalapenos, and mayonnaise on a fresh baguette). And those sandwiches sure go well with Nom Nom’s tasty basil mint infused lemonade…Check out the L.A. Nom Nom page for the full truck schedule. 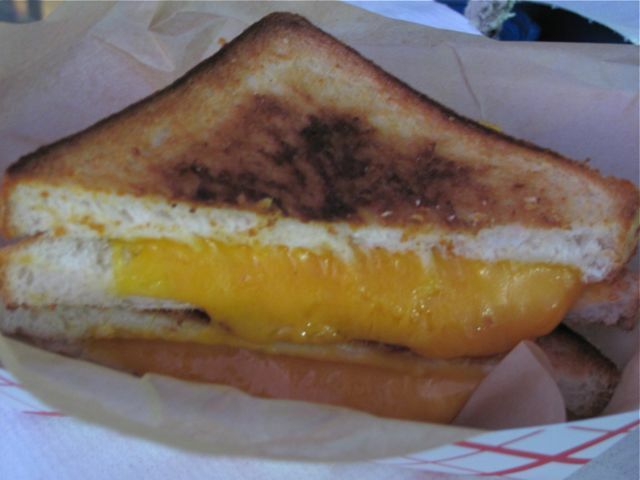 Rebel Bite: If you’re new to the Rebel Bite grilled cheese truck, you’re going to have to allow some time to “digest” the menu, so to speak. First, you have to pick your style (traditional with caramelized onions, or “rebel style” with bolognese or marinara sauce, caramelized onions, and optional caramelized kimchi). Then you pick your “game,” whether it’s marinated chicken or pork, or even tuna or eggplant. Too complicated for you? Then you can just settle for a classic grilled cheese (pictured). The Rebel Bite schedule is right on its home page. Looking for a regular food truck event? Here in the South Bay, check out Dinner on the Goal, every Wednesday from 5:30 to 9 pm at the Home Depot Center.